Got this radio from ebay paid around £6 for it inc P+P Cost, Looked on YouTube for any hacks Did not find any, so i decided to try hacking it myself. On the board it has a list 1-12 Cable 7 is MUTE, i clipped Cable 7 in the radio by taking a chance it my work in continue scanning, and lucky it Worked. So not i have another Radio Hacked to test out on EVP Sessions. Several weeks ago a new hack showed up on the internet which made it possible to take a $25 Radio Shack radio and modify it to work like a Franks Box. The main URL was www.ghostboxhacks.com. I am not exactly sure what happend to the information on that page and no further information was posted as to why it was removed, but for those who are looking for a cheap way to make a Franks Box clone, this is a simple hack that anyone can do within a few minutes. Pick up a 12-469 radio from your local Radio Shack. These are normally hanging on the wall near the headphones. Its a basic white AM/FM radio with headphones. You will need a small phillips screw driver and a small pair of pliers for this hack. Remove the screws from the back of the radio, there is 2 that are visible on the back and one in the battery compartment. Carefully pry the back apart, there is a couple of snaps around the outer edge which should give way pretty easily, but do not pull to hard, there are wires connected to the back which might break from their solder points. Remove the 2 screws from the inside PC Board. Separate the top PC board from the bottom. Be gentel, you may need to pull the plastic top where the headphone plug in out just a bit. On the board you just removed from the radio, you will see a row of pins which have small labels on them. Find the pin with the word “Mute” right under it. You can either bend this pin down and out of the way like I did, or just remove it all together. Put the board back into the radio. This can be a little tricky, be sure the pins line up by looking between the boards. Once they are lined up carefull push them back together. Put the screws back into the board. Snap the back on and put the screws in. Now you are ready to run your Franks Box clone. Put in some fresh AAA batteries and fire it up. You have just removed the mute capability of the radio, what this does it make it continually scan through the radio stations without stopping and allow you to hear it while its scanning. 1. Take screws out of the back, 2 are under the clip. 3. Cut the wire that lines up with the “Mute” designation on the board. That’s it, i’ve attached a picture of what the inside looks like. It’s upside down, but the second wire down is it if you flipped it over. In the picture it’s second up from the bottom. 1. Take 3 screws out of the back of the radio. 1 is in the back and 2 are in the battery compartment. 2. Open up the radio and you will see the circuit boards. Take the 3 screws out that are holding the top board to the bottom board. 3. Once screws have been removed, seperate the two board by gently pulling them apart. 4. The bottom board should now be exposed and you will see a row of pins at the bottom where it once plugged into the other board. 5. Locate the pin at the very bottom left and bend it back. 6. Re-assemble the boards back together and close the box. Putting the screws back into the circuit board is unneccesary. Just leave them out, the cover will make sure that the boards do not move. Also see this Video on hacking the Radio. this is how i cracked the new model radio shack 12-587 with ribbon connectors i sniped the 7 wire to the left but you need to touch the wire to the circuit were it was connected to get the white noise then more the wire after that it will auto scan then place a paper clip. There is a couple simple ghost box knock-offs that are available through your local radio shack store. The model that is a little harder to find is the older version of the 12-470, which includes AM/FM/TV/WB and also has a built in speaker. This model is gray and white and comes in a box. Since that model was getter harder and harder to find i decided to buy another similar scanning radio and see if it was hackable as well. I picked up a #20-125 radio, which has AM/FM/SW and also has a built in speaker. It seems to work similar to the other RS models in sweep rates. The procedure for hacking this model is quite simple. 2. Take battery compartment lid off and use that as leverage to take the box apart. 3. Once removed you should see the top board exposed with the LCD screen. There is NO NEED to touch the bottom board at all, just leave it alone. 4. There are 2 Gray clips on the top and also on the bottom that hold the top board in place. 5. Release the clips and the top board should swing away quite easily, please make sure nothing falls out. The only thing that may fall out is a couple plastic buttons for light and SW band selector. Both no big deal and can be easily re-attached. 6. Underneath the top board you will see what looks to be similar to a harddrive ribbon for a computer. On the top of the board you will see abbreviations pertaining to components on the ribbon. What you need to look for is MU, it is the 7th one down from the top. 7. Locate the wire going to that from the bottom ribbon side of the board, you will probably have to use a straight razor to push away some of the glue covering the wires underneath. 8. Once the wire to the MU is exposed, just cut it with the same razor, should only take minimal effort being it’s just a small wire. 9. Re-assemble together and when you turn on the unit no matter what band it will be just hold down the scan button either up or down until it starts going through the bands and now you can do some research. 10. This device may or may not work, but it’s affordable to most. I think it was $39.95 at my local Radio Shack. Results may vary and require some patience. 1. Take 3 screws out of case, 2 in the back and one in the battery compartment. 2. Take back cover off to expose inside of the radio. 3. No screws hold the board in, they are plugged into one another similar to the 12-469 set up. 4. Seperate the boards and find second row of pins and clip or bend back the 4th from the right. 5. 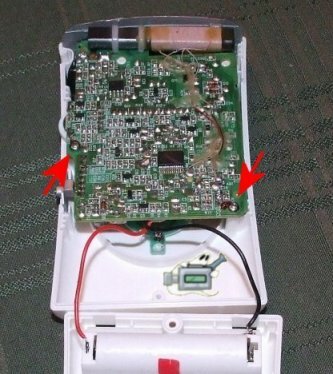 Watch out for the buttons as you perform the hack, so you can re-assemble them back where they came from. 6. Install back cover on the unit and put screws back in. 7. Turn radio on and hold scan button down and you’re good to go. 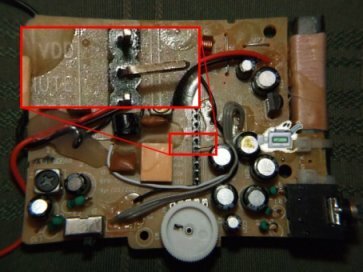 How do you modify (hack) the 12-587 Radio shack radio (The newer type)? The newer type has a ribbon of wires instead of pins!! PLEASE HELP!! D: I know someone knows how to do it because I’ve heard people being able to do it but they don’t post how they do it. This hack was discovered by Bruce Halliday and has come to be known as the “Halliday Hack.” It is an armband radio that needs an external speaker. It is important to note that only the “B” model of this radio can be hacked. This is one radio which i thought would not be possible to be hacked, but was i wrong. All you do is the following. 1: open up the radio. 2: goto the gray wires. 3: cound the 9th wire from counting from the RIGHT of the strip. 4: Cut or de-solder the wire. 6: press up or down scan, this should no be scanning throught the radio stations without stopping..
More pictures to follow soon. HE has tried the normal Wire Cuts, but had now joy, but he did find away of hacking the radio, by connecting 2 wires and a Switch to the UP/Down Tuning Switch, 2 wires and a switch to the UP tuner then 2 Wires and a Switch to the Down Tuner, this works but at the end of each scan there is a annoying Bleep. Not sure if this can be removed.? ?